Well, it looks like that launch went well. I was able to see it an hear it from the driveway, but I wasn’t able to get any good pictures. The picture above is from SFN. There was a bit of high level clouds towards the cape that kept me from seeing the rocket for a bit after launch. This particular configuration of the Atlas 5 also did not have any strap-on solid rocket motors, which made for a much smaller contrail on just the liquid oxygen and kerosene RD-180 main engine. Most launches I watch from home are shuttle launches, which usually head east pretty quickly after launch, tracing a nice curve in the sky. This launch however seemed to go strait up for quite a while before turning to head east. Of course the perspective makes it really hard to judge which way a rocket is going when you can only see it as a bright dot in the sky. For a few seconds I thought it was heading in my direction, before I realized that the rocket was still just going strait up before turning east. Pretty cool stuff. Today we have a launch of a super-cool spacecraft called the X-37. Stay tuned to SpaceFlightNow if you want to watch the launch, scheduled for 4:09pm eastern time (2:09 mountain). This is a slick little unmanned spacecraft the Air Force is using for some classified research projects. It looks kind of like a smaller version of the space shuttle, but a lot smaller. There is no cockpit, the payload bay is only 7 feet long and 4 feet wide (the shuttle’s is 60 feet long and 15 feet wide), and the engine on it is only used for orbital maneuvering, not for launch. 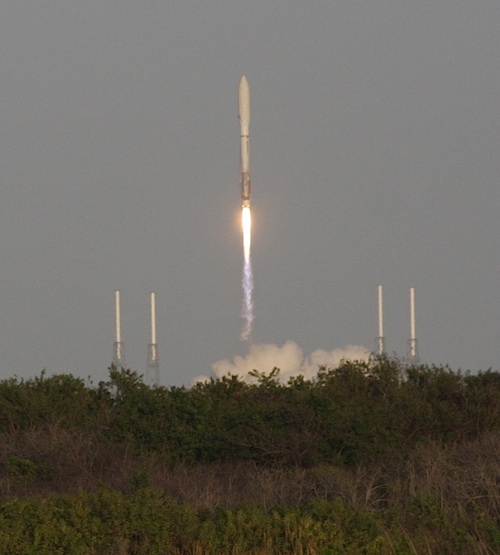 X-37B is launched atop an Atlas 5 rocket, inside a 5 meter diameter fairing. The engine on the X-37B uses hypergolic propellants (They ignite on contact with each other) and allows the spacecraft to change its orbit once in space. 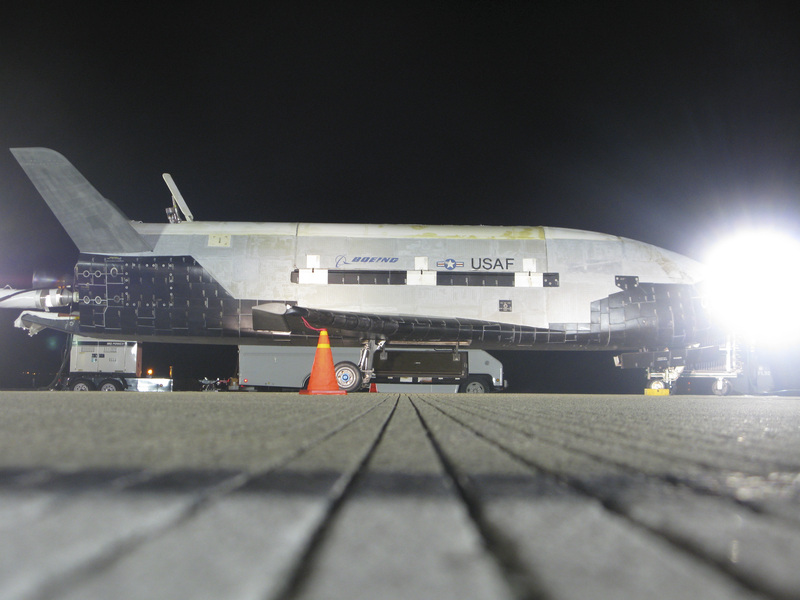 This will be the second launch of an X-37B, another was launched last april and spent 6 months in space. That vehicle landed last december, with a flat tire the only announced problem with the almost 8 month-long flight. Of course, because it was an Air Force mission, most details of the flight are still classified. Switching on the pure speculation on my part. 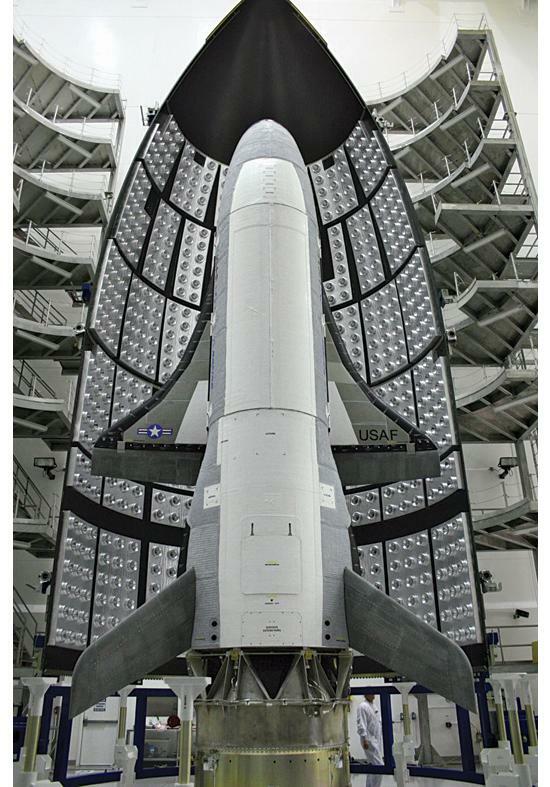 I don’t think the Air Force is planning on building anymore X-37Bs, but I would guess that these will be used to develop the technologies to build more advanced spaceplanes in the future. This type of vehicle would probably not be used to carry any weapons. The nature of orbital mechanics would severely limit the usefulness of any kind of weapon it might carry. I figure that this improved spaceplane would probably carry an optical camera package, which could take digital photos in orbit and transmit them back to earth like a normal spy satellite. Then, when it starts to run low on fuel or other consumables, it would be re-entered. The camera package could be modified or upgraded and relaunched. Of course each launch would require a new launch vehicle like current disposable satellites, but all the control and propulsion and power systems could be re-used. Of course this would only work if the cost of refurbishing the spacecraft after landing is less than the cost of building a new one. So, lets watch this launch ( I will from outside, I’ll try and get some photos) and let me know if you have any questions. Thanks! UPDATE: The rocket had a faulty pressure regulator valve which had to be replaced. The launch countdown has been resumed and launch is scheduled for 5:46pm eastern.